Welcome to the sides of Network Photography/(former) Nikon community, the world famous photocommunity. The Network Photography, former known as Nikon community, ranks among the largest photo Communities in Europe with far over 110.000 members world-wide. 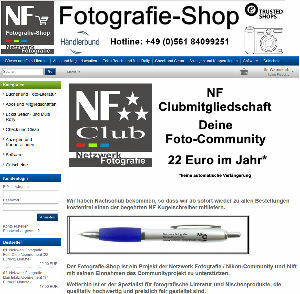 At the forums of the photo community you arrive over the left forum in the navigation border. Over the menu option you arrive to registering directly at the free and simple registration, which makes it for you possible to participate actively in the community of the photographers to topics and contributions to write and show pictures. You have questions, suggestions or problems with the sides and/or the software of the community? Please use our support, over which you can open a ticket. You´ll find there also our FAQ, which details perhaps fast and answers your question. At this time our FAQ is only available in German, but you can use your language to write messages. You are interested in a partnership with one of the world-wide largest and most competent photo communities? Please learn more in our current Media information and the winning philosophy of the Networks Photography/(former) Nikon Community.